Michael, Andra and Best in Show, Silver Charm. Our company founders, Andra Hearne has a Master's Degree in Animal Nutrition and a Ph.D. in Food Chemistry and Michael Hearne has a degree in Mathematics. Dr. Hearne has published articles and conducted research in nutrition and food chemistry. She believes that information and knowledge should be distributed to animal lovers so that they may gain the insight about optimum health for their champions and companions. The company was founded when we recognized the need for healthy treats that pets love. Michael's experience with small business, and Andra's education and background in the food industry combined to produce Power Paw Products, a company committed to providing healthy treats for pets that they love. We hope that, all animal lovers, will become as passionate as we are about nutrition of their beloved pets. We believe that proper nutrition is the key to health. 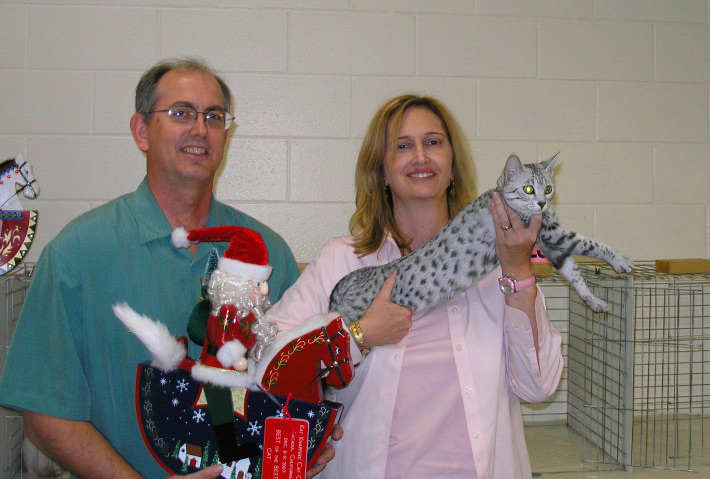 Dr. Hearne also raises Egyptian Mau cats. Her quest for proper nutrition carried over from her days of showing horses. When she first started, she consulted with her vet to get her recommendation on diet. Her vet recommended that a raw diet was the best based on her personal experience. One of the vet's pets had developed diabetes as a result of feeding kibble. It was discovered that the raw diet lowered her pet's insulin level and eventually reversed her pet's diabetes. While a diet may not always cure a disease, it is certainly a preventative measure. Dr. Hearne researched this recommendation and began switching all of her animals to raw diets. It is our pleasure to pass on our personal learning, expertise and experience to our customers.